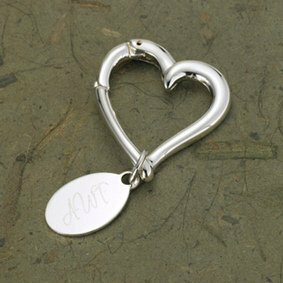 SHARE This beautiful open heart key ring makes the perfect gift for your bridesmaids or personal attendant. We will customize the silver plated oval nameplate with three initials of your choice, making it a very personal and practical gift. The nameplate is approximately 2-1/2" across. The charming set is packaged in a gift box, so all you need to do is add a bow for easy gift giving! Be sure to order one for yourself. Note - This item includes a personalization, color, size or design option: Text Line 1 (e.g., Initials) (max of 3 characters) (Free of charge). You may specify this information during our checkout process.